Francesca, Portuguese water dog on her kayak on Lopez Island in the San Juan Islands north of Seattle. The painting on the left is the digital version of the portrait. I always create a digital version first and work w the client to arrive at the composition, colors, and content of the painting before I start a hand painted canvas. It can be a months long process before a final hand painted canvas is finished, and it's never done until the client is happy! Francesca is happy too, but she is always happy. Especially when she gets to go to Lopez and kayak! 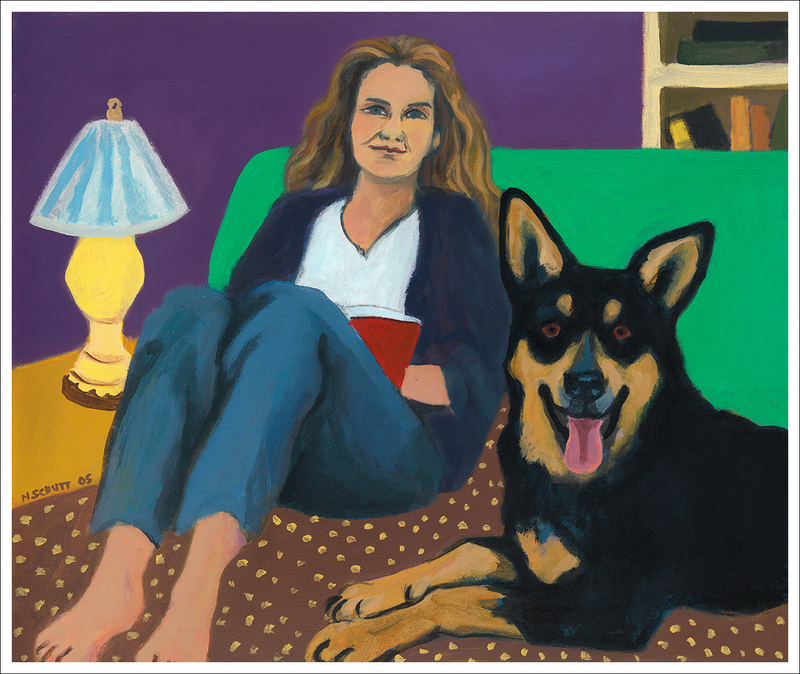 Original iPad painting by Seattle dog artist, Nancy Schutt. Happy Presidents Day to FDR and Fala. May your policies and values live again at the White House! Another painting commissioned as a holiday gift, this one from parents to daughter. Meet Marley, the Portuguese water dog who doesn't like the water. She will wade out up to her ankles, then prance back to shore, seemingly a bit confused. Here she is at her window seat overlooking the lake in which she'd prefer not to swim. Sweet Marley, named after the extremely talented musician- (but she's a she- not that it matters). Wolf, reservation dog, found on the Navajo Reservation in Arizona. He is a dog who wasn't meant to live- but then he did. He'd been abandoned and was found lying on his side, dying. Susan took him and gave him a chance at life, which turned out to be a very good one. Wolf exuded dignity, confidence and calmness. He was steady, consistent, composed. He would look you straight in the eye and communicate his take on things, which was pretty much always, "no reason to get bent out of shape, everything is fine." He was unruffled, even when there was chaotic activity around him. It was like he would watch and assess a situation, and then place himself in it as a calm, non-reactive presence, modeling for us how to live in this world of change. When Susan and Wolf and my cranky Chihuahua, Pablo, and I would take walks together in a wooded area of Seattle where dogs often walk off leash, he would choose some giant fallen branch to carry along the path then drop it for me to sling a few feet so he could bring it back, with us wondering how in the world he could carry, in his mouth, something so massive. I started throwing his log choices over the ledge into the gulch just to make it require at least as much effort for him to retrieve as it was for me to hurl. As a young dog, he was tireless. His physical stature was impressive- strong, capable, in command, and gorgeous. He knew it. Sometimes large dogs would start to approach little Pablo and Wolf would place himself between Pablo and the intruder as if to say, "You gotta get by me first". He was Pablo's protector, even when Pablo would have a snappy outburst right in his face. Wolf never reprimanded Pablo, not once. He would just turn away and walk on as if nothing happened, and he would protect that pesky little pack member again the next time. If I were to put words in Wolf's mouth they would be, even about his own death- "There is nothing serious going on here, all is well. I am still here. Now throw the log." "May you be blessed with peace, joy, and love. In other words, a bed, a book, and a dog." Working with more greeting card and T shirt ideas, taking the image from the original painting and simplifying it. This is Daisy, the sweetest, most gentle giant you'd ever hope to meet. Original painting by Seattle dog artist. Another possible greeting card, with or without caption, I'm not sure yet. Is this the wisdom of the fool? Is this dog brilliant or a knucklehead? I'm considering producing a line of greeting cards, all in the same style of flat color backgrounds, and using images from earlier paintings for the dogs combined with a sketch depicting a setting. Not sure if they should be captioned or just images, themed or not. Caption ideas? Woody is a shy Golden Retriever, Sadie is Boss of the World. Opposites often makes for good friendships, and it sure does for these two. We had trouble figuring out how to transport the painting after finding out that they won't let me carry it on with me on the plane. So we bought a suitcase big enough to fit the painting and we fretted about the possible damage... but I bubbled wrapped it, wrapped in blanket and it worked out perfect! She was completely baffled that we brought something so big and special! haha. She thought that painting captured the personalities spot on! It fits perfectly in her cozy small living room where she can enjoy it often. This whole experience of creating a painting for our mother, working with you to make it reality was a true gift! Ema and I really enjoyed it! I hope our path will cross again soon! Thank you Nancy, will always remember your kindness! Allie, lucky rescue dog, at home with her family portrait. Poochapalooza is this Saturday! A full day of fun times for dogs and the humans they own! Wiener dog races! Pie eating contest! Highest jumper! Best kisser! Fastest sprinter! and much much more!!! July11, in Marysville, WA. 10-4 Even if you don't enter your dog in a contest, it's tons of fun to watch and be part of the most hilarious dog event of the year! From the happy family who lives with Casey Jones and Mr. Poppers and received the painting that I shipped to them last week. "Dear Nancy We unpacked the picture and hung it in our kitchen. We truly love it. You have captured our special pets perfectly. It is a true treasure. We cannot thank you enough for this marvelous tribute to our furry friends. Again many thanks!" Two rescues in one painting (Jack Russell terrier and a cat), plus one bunny. New York City. Casey Jones, Mr. Poppers, and the neighborhood bunny as an actual painting, alongside the digital painting which preceded the final painting on canvas. I work out most of the composition and colors in the digital painting, but an actual painting has it's own life and dictates, so it never looks quite like the digital version- as it should be. Casey and Mr. Poppers are standing at the front porch entryway to their home just outside New York City, where they, the family, and the painting all live. The neighborhood bunny likes to taunt them. They give chase, but never catch up. Jack of Hearts by Robin F. Gainey is out in paperback (Shimoni, the Jack Russell terrier on the cover is a cropped version of one of my paintings). Robin says "My novel, Jack of Hearts, is #5 on my publisher's Best Selling Paperback List after just one month!!!" (It's about the observations of a JRT in Italy who shares life with some not so valiant humans). Get it! Meet Jodi and Moose, sisters for brothers. The family got Jodi and Moose as pups so each son could have their own dog. They would like a studio painting of the, now quite large, sister dogs. I start a studio painting with an iPad sketch of the proposed painting. It's not meant to be a finished painting for printing on canvas, but rather a mock up for a studio painting created with brushes and paint on canvas. I do create digital paintings for printing on canvas, but they have more detail and a more finished look to them. With this painting, that will happen in the studio.